Fracking protesters climb on to a truck on the M6 southbound services at Forton earlier this week. Lancashire Police have been reimbursed just a fraction of the costs of policing the ongoing fracking protests in Preston New Road. Despite repeated requests outlining the growing costs of the policing operation - which by the end of March 2018 will have reached close to £7 million - Lancashire has been handed just £1.4 million back from Government, the minimum allowed under Home Office rules. Lancashire's Police and Crime Commissioner, Clive Grunshaw. Lancashire’s Police and Crime Commissioner, Clive Grunshaw, has urged Police and Fire Minister Nick Hurd to reconsider the decision. Mr Grunshaw said: "This is a bitter blow for Lancashire and I have already written back to Nick Hurd urging him to reconsider and to Lancashire MPs to lend their support. 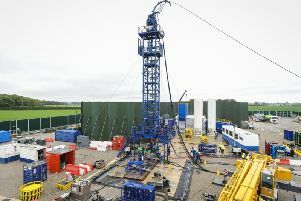 Cat Smith, the MP for Lancaster and Fleetwood has reacted angrily to news that the Government has refused to fund the policing costs at the Preston New Road fracking site. Cat Smith, the MP for Lancaster and Fleetwood, has reacted angrily to news. “This is disgraceful,” said Ms Smith. “This government has forced fracking on Lancashire and now they are passing the costs of policing it onto Lancashire as well. Smith added: "Fracking is not the answer to issues regarding energy security or climate change. "It is the wrong option for our local environment and the wrong option for our country’s energy needs. Ms Smith is set to write to Police and Fire Minister Nick Hurd urging him to do the right thing and reconsider his refusal to cover the policing costs. A Home Office spokesperson said they have provided Lancashire Police with up to £1.4 million of funding “in accordance with published special grant guidance”.